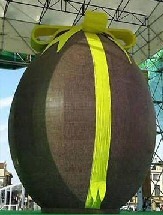 The Belgian chocolate producer Guylian made this chocolate egg with at least 50,000 bars [amounting to some 1950 kg of chocolate in total] on behalf of the city of St. Niklaas, Belgium. The egg measured 8.32 metres high. Apparently twenty-six craftsman worked altogether 525 hours to build the egg. After displaying the egg in the open air for a week, and in all weather conditions, Will and Guy suspect that it is unlikely to taste very good. For many children Easter wouldn't be the same without chocolate eggs. However, those eggs generate around 3,000 tonnes of waste just from their packaging alone.